Despite higher fuel costs, the no frills carrier has managed to reduce losses in the first six months of 2012 to £112m, down from £153m year-on-year. Stelios’ bright orange baby is looking rather less jaundiced today as it reveals reduced interim losses. 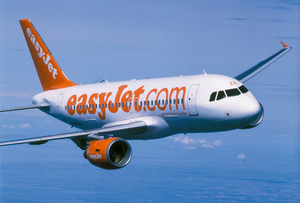 EasyJet has slowed its profit decline through ‘tight control of costs’, it reckons. That, and ‘exceptionally low levels of disruption’: the mild weather across Europe meant most of its airports stayed open for business across the troublesome winter months. Nevertheless, preserving margins has not been easy. The airline’s fuel costs jumped £100m over the period, with staff and aircraft maintenance expenses also up, pushing the total cost per seat up to £54.34, a 7.4% jump. Most of the rises have been pushed onto the consumer, of course, mostly through those fiddly extras: checked baggage, excess weight and admin fees. With these tweaks, easyJet has managed to inch up revenue per seat 11.9% to £50.47. EasyJet chief executive Carolyn McCall is keen to stress that these results are far better than expected, however, and that investors should not get too comfortable. ‘It is important to appreciate that this was an exceptionally good result,’ reads easyJet’s statement this morning. Indeed, with cancellations and delays down 90% year-on-year, easyJet found itself with £15m more than expected in the bank. Serendipitous, yes, but not a reliable source of cash. The year ahead will likely be a difficult one for the airline. EasyJet will have to contend with increased competition in aviation - not least the looming threat of FastJet, Stelios' new airline, sky-rocketing fuel costs, and also internal strife: majority shareholder Stelios' bickering with the rest of the board has been well documented. Still, traders are seeing some safety in the colour orange: EasyJet’s shares are up 0.5% 512p in this morning’s trading.